From homes and restaurants to retail businesses and offices throughout the state, including College Station, TX and the Brazos Valley, everyone can run into their own set of pest control problems. A licensed pest management professional at Entec provides a professional pest control strategy designed to meet your residential or commercial needs. 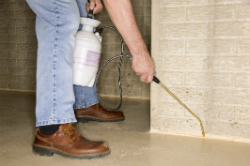 For fast, affordable and reliable termite control, bee control, and other pest control services, call Entec Pest Management Inc. in Bryan, TX and Brenham, TX today! Bee control & removal exterminating & fumigating - Pest control Spraying - Shrubs, Trees, Yards Termite control Tree Spraying Svc. Entec Pest Management, Inc. specializing in Residential, Commercial & Industrial pest control, Bee control, Termite control, Spraying, Rodent control, Roaches, Ants, Silverfish, Rats or Mice for all your pest concerns.